Bowser has invaded the Sprixie Kingdom, and bottled the eight Sprixie Princesses. Mario, Luigi, Peach and Toad set off to rescue them in this strange new world. Up to four players can work together to clear stages, or compete for the crown. Use the Super Bell to don the Cat Suit. Swipe enemies and claw your way up unscalable walls. Search for the Green Stars and Miiverse Stamps hidden in every stage. Touch the Wii U GamePad screen to interact with touchstones, and use the built-in microphone to activate fans. 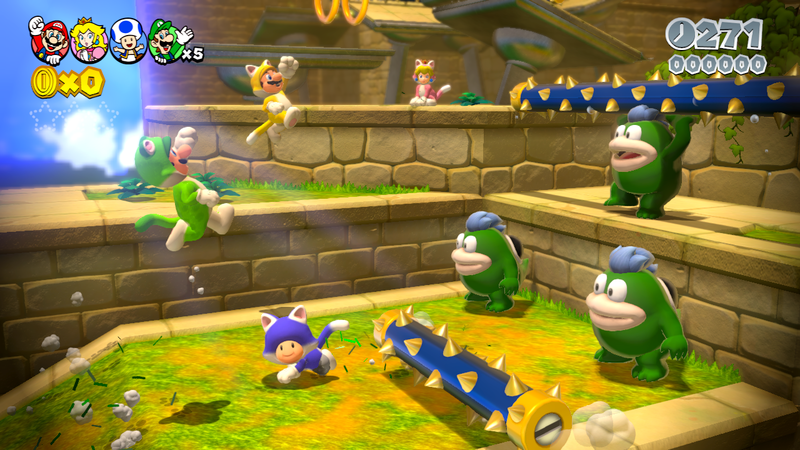 Take control of Captain Toad in special stages where you can't jump.